Do you dread the holidays and all the calories that come with each feast?! Do you worry about how and when you’ll drop the weight that you put on between Thanksgiving and Christmas!? Well, there really is no need to have to worry about these things…if you put healthier options on your plate! Right?! This year, I’ve teamed up others who want to help you survive this holiday season, help you not put on any pounds, and help you write New Year’s resolutions that don’t include dropping the holiday weight gain. 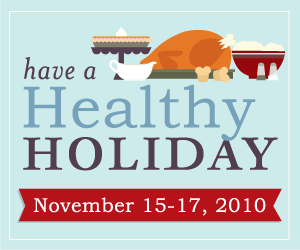 Each of us will be posting a few Healthy Holiday recipes on our sites, starting November 15th. We will also be hosting a #healthyholiday party on Twitter on Wednesday, November 17th at 9 pm EST. There will be an RSVP post coming soon…so you can let us know you’ll be there…and make you eligible for prizes! I’m honored to be part of this amazing group of women participating in this year’s have a Healthy Holiday! Once we have posted all the recipes, we will each post a complete list of all the recipes created for have a Healthy Holiday! So be on the lookout for all the amazing healthy recipes and ideas, starting Monday the15th! Let’s have a Healthy Holiday, shall we?!? Plan to be there! Though, I want to try to brine a turkey this year. Will that enter into the equation? What a fantastic idea! I will be looking forward to all the posts! Wow – this is a fabulous idea! Every year’s Thanksgiving meal always leaves me feeling stuffed and guilty. Can’t wait to learn some healthy holiday recipes.